DGS Girls CC 5th at State! 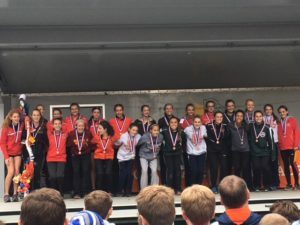 The DGS girls cross country team placed 5th at the IHSA State Meet on Saturday. Naperville North won the championship with 87 pts, followed by Yorkville with 117 pts. As expected, there was a close team race for 3rd with Mustangs only 10 pts behind Lyons Township (184 pts), and 1 pt behind Wheaton South (193 pts). DGS scored 194 and Glenbard West placed 6th with 212 pts out of 25 qualifying teams. This is the 3rd time DGS has placed 5th in the state (1985 & 1989) and the 9th top 10 finish in program history. 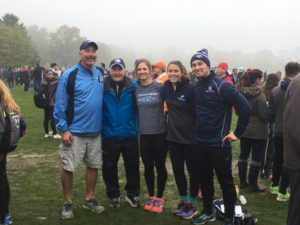 Brenna Cohoon (So) has been the top finisher for the Mustangs all season long and Saturday was no different. 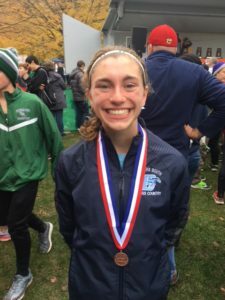 Brenna ran an amazing race to finish 19th and earn All-State honors. 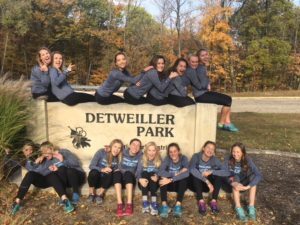 Her time of 17:08 on the Detweiller Park course set a new DGS school record for 3-miles! The previous record of 17:13 was set by Amanda Thate (class of ’14). Brenna started off the race around 30th place and slowly moved up into the top 25 by the time she reached the 2-mile. In the last mile, she continued to move up and eventually made it to 19th. As has been the case for most of the season, the strength of this team was the closeness of its pack. On Saturday, the Mustangs had a pack of 5 girls that ran close together for most of the race. At the mile, they were all together, shoulder to shoulder. Together they moved up in the field while running in the back triangle part of Detweiller Park. Over the last mile, they continued to pass more runners and eventually the 2-5 runners finished within 5 seconds of each other. Melissa Weidner (Jr) led the DGS pack for most of the race, finishing in 52nd place with a PR time of 17:50. Kennedy Warden (So) ran alongside Melissa and finished in 55th with a PR time of 17:51. Erin Reidy (So) held the middle of the pack and sprinted hard at the end to finish in 62nd place with a PR time of 17:53. Becky Versaskas (Jr) completed the scoring pack, finishing in 67th place in a SB time of 17:54. Rebecca Diddia (Fr) ran with the 2-5 pack for the first 2-miles before falling slightly back. Her time of 18:08 was a PR as she finished in 95th. Gillian Thomas (Sr) was the lone senior racing for the Mustangs on Saturday. She ran a SB time of 18:51 to finish in 177th place. The state series team included several alternates who didn’t race at State, but helped the team accomplish these lofty results. 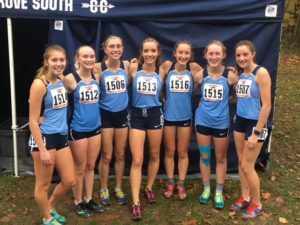 The alternates included Kelley Hackbarth (Sr), Allison Calek (Jr), Olivia Duax (Jr), Julie LaLonde (Jr), Olivia Meyer (Fr), Kailey Ferguson (Fr), Maya Scheck (Fr), and Meghan Stapleton (Fr). There was also a lot of great support from the other members of the team and the DGS community. This was the first year that the school sent a fan bus to the meet, which was awesome. 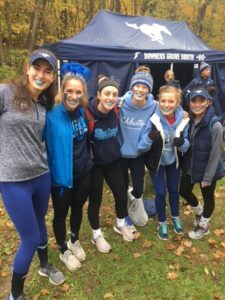 Many of the seniors that came down were decked out in lots of blue school spirit that helped set the mood for a great DGS meet. 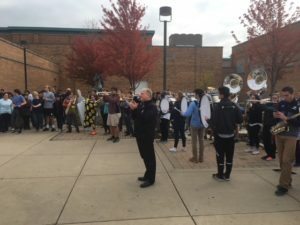 There was great support from the school as a whole as many teachers brought their classes out on Friday morning to see the team off as they left for Peoria. The DGS band provided a great atmosphere that really pumped the team up! All in all, it was a greatly successful weekend. Although last year’s team placed 4th, they were over 100 pts away from 3rd place. This year, our score was 50 pts lower and we were only 10 pts away from 3rd. With our top 6 runners returning, and many more girls continuing to work hard and improve, the future is certainly bright for the Mustangs! Full meet results can be found on the Athletic.net website. Individual results/splits can be found on the Schedule/Results page. Pictures from the meet can be found on the Pictures/Video page. 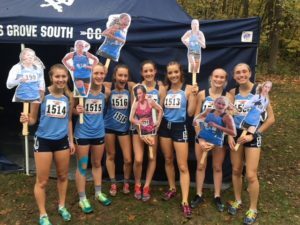 Author Coach PlunkettPosted on November 5, 2017 November 5, 2017 Categories Cross CountryLeave a comment on DGS Girls CC 5th at State!